Regular followers of 365 days of orchids will have noticed an improvement in photograph quality since we started in January 2017. The team in charge of photography includes Joe, Ben, Ed, Otto and Ed and they have developed their skills over the past 13 months. Most photographs are taken with digital SLR or Bridge cameras although phones and i-pads with macro and microscope lenses are often used for very small flowers. 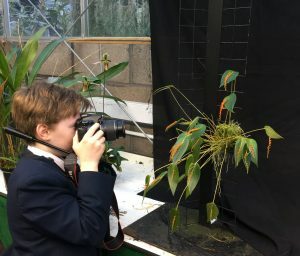 As you can see in the photo Joe is using a tripod and our black cloth photo area to take the picture for todays post – Pleurothallis truncata. Your photography is brilliant. Clearer than in real life. I like the way I can really zoom in on my ipad to look at the details. Well done!